Baton Rouge, LA – February 16, 2015 – Digital billboards are getting heart healthy in February, thanks to a new social media effort. Lamar Advertising Company (Nasdaq: LAMR) has partnered with the Cincinnati American Heart Association to celebrate Heart Awareness Month in an interactive way. The Heart Heroes campaign, which is running throughout the month of February, integrates social media and digital out-of-home to spread awareness about the importance of being heart healthy and to honor those who have been affected by heart-related illnesses. People are encouraged to post photos of friends and family who have been affected with heart issues – otherwise known as “Heart Heroes” – on either the Lamar Advertising of Cincinnati or Cincinnati American Heart Association Facebook pages. 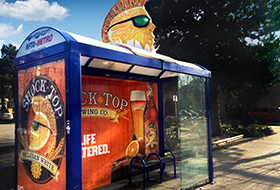 From there, Lamar uses the technological capabilities of its digital network to display the user-generated photos and names from Facebook directly to digital billboards in Cincinnati. 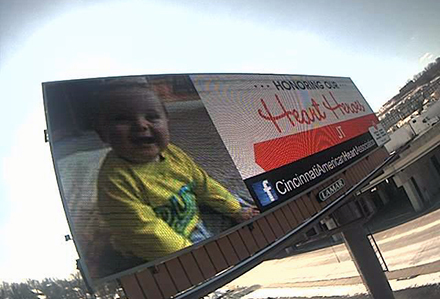 Webcam shots from the digital billboards are posted in a Heart Heroes album on the Lamar Advertising of Cincinnati Facebook page, so people can see their photos running on the billboards. 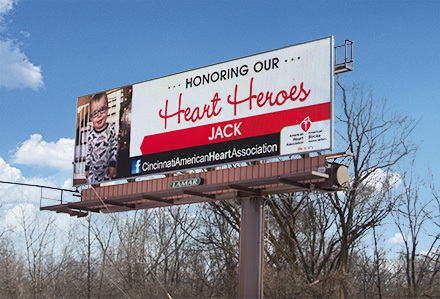 The Heart Heroes’ photos are displayed on digital billboard space throughout Cincinnati donated by Lamar Advertising Company (above). Webcam shots from the digital billboards are posted in an album on the Lamar Advertising of Cincinnati Facebook page (above). In addition to the digital billboard component, the campaign’s message is being spread heavily through social media: a search for #HeartHeroes, #HeartHealthy or #CincyAHA yields hundreds of results related to the campaign. The Lamar Advertising of Cincinnati Facebook page also increased its post reach by 3,108% since the campaign started in February, as compared to the previous period in January. For more information about the campaign, please visit the Lamar Advertising of Cincinnati Facebook page. The U.S. Marshals Service Northern Iowa Fugitive Task Force (NIFTF) partnered with Lamar Advertising Company to make the public aware of a wanted fugitive. 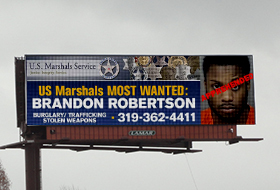 Shortly after Lamar displayed Robertson's "Most Wanted" status on digital billboards throughout eastern Iowa, the public quickly responded with phone calls coming in to the local US Marshals Fugitive Tipline. Today, Lamar Advertising Company (Nasdaq: LAMR), one of the largest outdoor advertising companies in North America, announces its new partnership with Blue Bite, the Mobile Standard in Out-of-Home, which will give advertisers the ability to create measurable mobile campaigns through the use of outdoor media.